In the ongoing debate about evolution, science and faith face off. But the truth is both sides are right and wrong. In one corner: Atheists like Richard Dawkins, Daniel Dennett, and Jerry Coyne. They insist evolution happens by blind random accident. Their devout adherence to Neo-Darwinism omits the latest science, glossing over crucial questions and fascinating details. In the other corner: Intelligent Design advocates like William Dembski, Stephen Meyer, and Michael Behe. Many defy scientific consensus, maintaining that evolution is a fraud and rejecting common ancestry outright. Perry Marshall approached evolution with skepticism for religious reasons. As an engineer, he rejected the concept of organisms randomly evolving. But an epiphany--that DNA is code, much like data in our digital age--sparked a 10-year journey of in-depth research into more than 70 years of under-reported evolutionary science. This led to a new understanding of evolution--an evolution 2.0 that not only furthers technology and medicine, but fuels our sense of wonder at life itself. This book will open your eyes and transform your thinking about evolution and God. You'll gain a deeper appreciation for our place in the universe. You'll see the world around you as you've never seen it before. Evolution 2.0 pinpoints the central mystery of biology, offering a multimillion dollar technology prize at naturalcode.org to the first person who can solve it. Perry Marshall is an author, speaker, engineer, and world-renowned business consultant in Chicago. With a decade of research, he brings a fresh perspective to the 150-year-old evolution debate. Bill Gates of Microsoft and the founders of Google revolutionized software and the Internet through their status as outsiders. Similarly, this book harnesses a communication engineer's outsider's perspective to reveal a century of unrecognized research and discoveries. 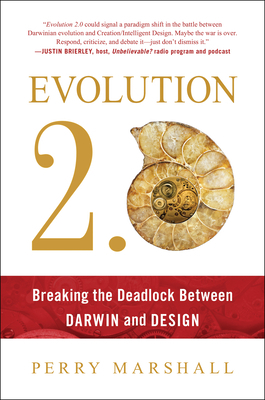 Evolution 2.0 resolves the conflict between Darwin and Design, opening new avenues of science research and raising tantalizing new questions. Perry's work in digital communications, control systems, acoustics, and e-commerce bring practical insight to questions about nature and science. His books include 80/20 Sales and Marketing, Ultimate Guide to Google AdWords, and Industrial Ethernet. He has a degree in Electrical Engineering. He's consulted in over 300 industries, from computer hardware and software to health care and finance.